I haven’t blogged much about gaming, because I’m too busy playing and having fun instead. I was having fun in Pandaria, maybe I’m the only person playing that enjoyed it or something. Granted, the Pandaren race didn’t excite me, but I do very much enjoy the class that they brought in with them (the monk) and the zones and music. So pretty much most everything except the physical appearance of the Pandaren, which I realize is a personal preference. I finished up all the quests I could find in Jade Forest and moved into other zones, but WoD released so I jumped into that as soon as I could. It started with a quest line that lead to my initial garrison… but I’m sure you knew that because everybody has talked about it. 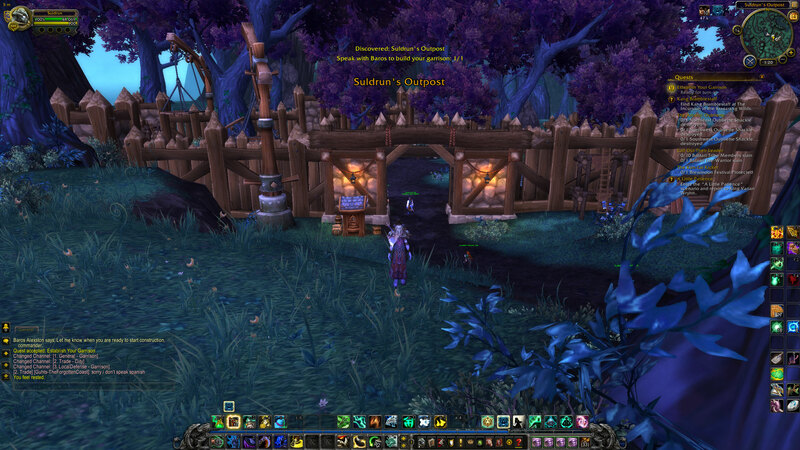 So far I am enjoying the garrison mechanics. I’ve upgraded to a Level 2 garrison, and have an alchemy lab, dwarven bunker, storage, and inn. I’ve tried out alchemy work order, as well as mined in the excavation just outside. I started the fish quest and am midway, and notice there is an herbalist as well, with a grayed out exclamation point (quest marker) – so that’s something I’m not yet eligible for. I’ve queued up for 2 Draenor dungeons so far: Bloodmaul Slag Mines and Iron Docks. Both were mostly with guildies and fun to do. The loot is good too but we’re not in gearing up mode right now; I just like the grouping plus the gold and experience is really worthwhile. I’ve noticed that certain tough boss-type monsters in the open world – I’ve seen the playerbase refer to them as elites and also as rares – aren’t tapped/tagged by a single player. Meaning, you can join in while somebody else is fighting, help out, and get credit for the kill too. That’s really cool and promotes light teaming here and there. If nobody is around I’ll give it a shot, but keep my Touch of Death skill handy. That one lets me kill a target of less health than me (there is a modification to where it works on a raid boss if the boss is less than 10% health) so I’ll fight, heal myself, and keep an eye on when my enemy dips under that threshold. The level 90 boost is an excellent idea, IMHO. It lets somebody like me actually play with others that have max level chars. The timing was good too, I had a few weeks before the expansion went live so I could play a class for a while to see if I liked it, then boost and have some time at the old level ceiling to quest (earn money) and acclimate to new skills I gained. If the boost didn’t exist, then either my friends would have to be willing to level yet another char, or I’d just pretty much be solo while coming up the ranks. I tried that before and it didn’t work, leading to my first unsub. I don’t mind mostly soloing while leveling, but being left out of grouping when you have RL friends also playing is tough – even though it is nobody’s fault really. I was too low level to join them, they were too powerful to join me, so the two options were: (me) level like crazy to catch up, or (them) start another char to level with me. GW2 has a nice solution with the down-leveling mechanic… maybe Blizzard could think about implementing something like that. But GW2 was always that way from the start; I can imagine many WoW players wouldn’t want to downlevel the char they’ve played to a high level. Or who knows, maybe they would. What’s different for me this time around is I have 3 real life friends also playing AND I have one high level character that can join them. So I’ll quest a bit, and when we have critical mass (including other guildies as not everybody overlaps their play) we’ll do a dungeon which is great variety and lots of fun. I do plan to level another char as a secondary goal, but I can’t say enough how the level 90 boost really made the difference for me. Anyway, just a bunch of random thoughts from a level 95 monk.